Home › Budgeting Tools › PocketSmith Review 2019 – Predict Your Financial Future! 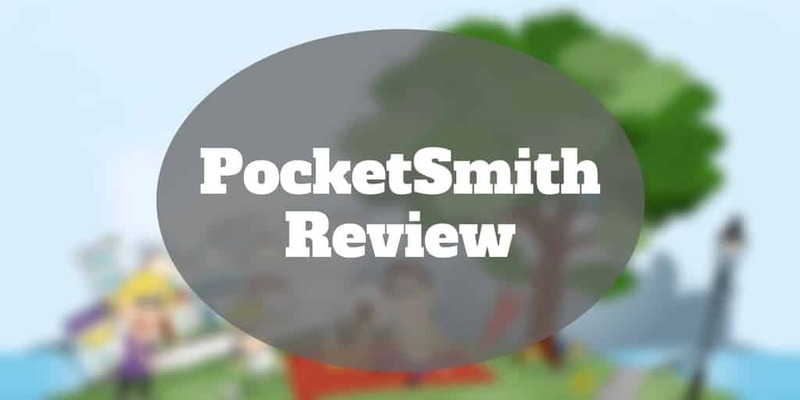 PocketSmith Review 2019 – Predict Your Financial Future! PocketSmith is not your average budgeting tool. While most budgeting apps synchronize with your bank accounts, credit cards, and loans, and display them all in one place, PocketSmith goes a step further and gives you insights into what your cash flows might looks like far into the future. 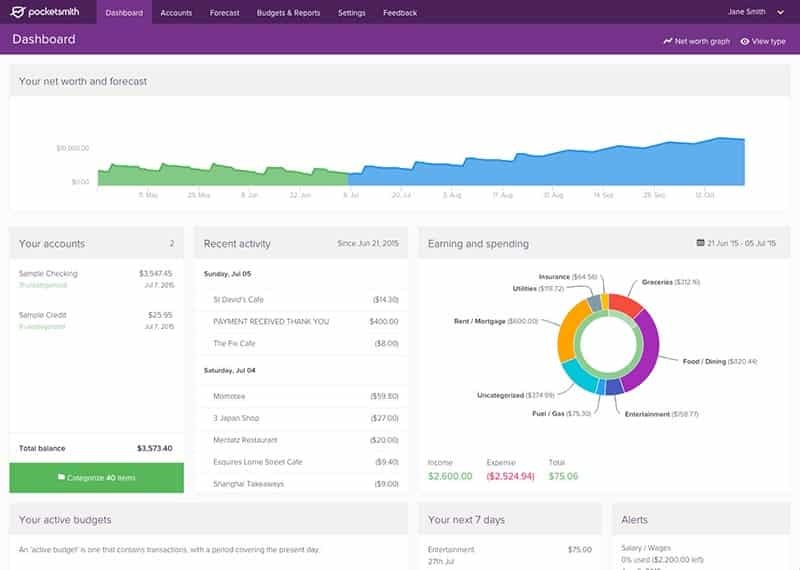 Think of PocketSmith as a virtual time capsule that lets you see previous financial transactions easily in an online dashboard, view present spending in order to see where your money is going and get better control over it, and visualize what future balances may look like with the PocketSmith calendar. You can create “what-if” scenarios too so if you were to save more you can see how much more money would be in your nest-egg, and how much extra you could spend during your retirement years. PocketSmith has three subscription tiers, ranging from free to $19.95 per month, but realistically only the two paid options will save you time and make it easy to budget effortlessly. PocketSmith started out in New Zealand, but it serves clients globally so no matter what country you are based in the chances are PocketSmith can serve you equally well. If you subscribe to either the Premium or Super plan, you can import all your accounts automatically and view all your accounts in one place. A search engine is provided by PocketSmith to help you find transactions that you previously organized, tagged, annotated or categorized. As a global budgeting tool provider, PocketSmith shines when it comes to global currency conversions. You can track bank accounts, assets and liabilities in different countries and automatically convert to a single currency based on current forex rates. 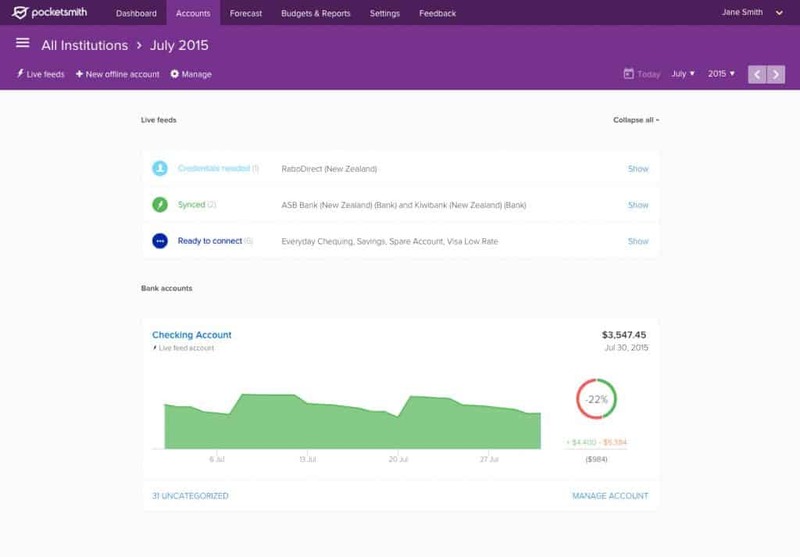 PocketSmith is compatible with leading accounting software, such as Xero, so you can connect and send expenses from your Xero account to your PocketSmith account in a few clicks without needing to resort to manual entries. Perhaps the best part of PocketSmith is its financial forecast visualizations that let you virtually peer into the future by creating cash flow projections based on current balances and anticipated growth rates. 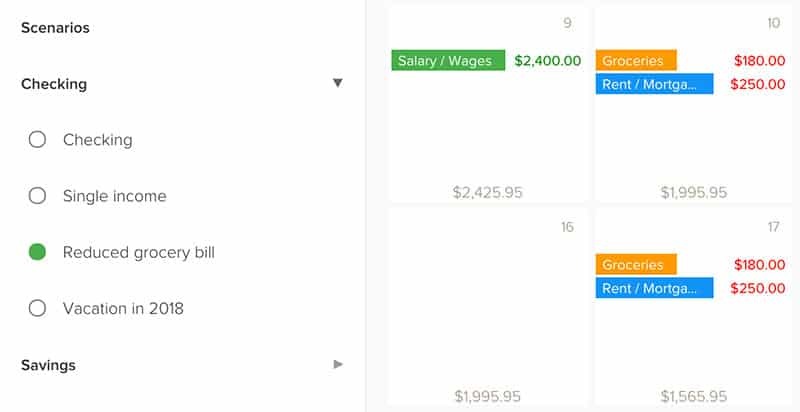 The calendar feature is intuitive, and it can be used to help you schedule upcoming bills also. An especially nice feature is called Scenarios, which help you to project ‘what-if’ situations. For example, what if you reduced your grocery bill by a certain amount each month? Or what if your income or savings rates went up? How will these changes affect your monthly expenses? PocketSmith does a good job visually depicting the effects of these changes. You can easily break down your budgets into manageable chunks. For example, you might decide to set a weekly grocery budget, and PocketSmith will tell you if you come in over or under budget, and when the next period begins so you know how much you have available to spend. 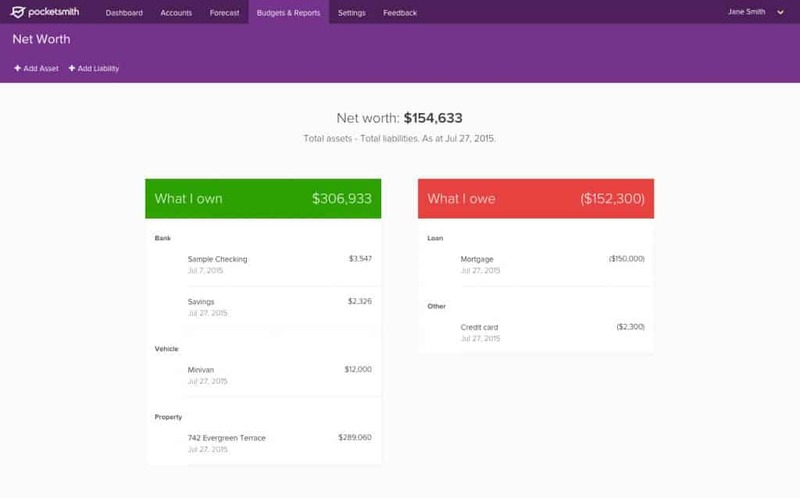 To view your net worth and forecast what the future looks like all in one place, view the Dashboard, which displays in an intuitive pie chart the percentage of your spending that is allocated to mortgage or rent, groceries, auto payments, food and dining, fuel, insurance, utilities, and so on. If you are close to a budget limit or run over budget, you can set up notification alerts so you can take action before it’s too late. And by knowing that you are at risk of running over budget, it might nudge you to hold off on making an impulse purchase. A real challenge of having a bunch of bank accounts, credit cards, and loan accounts is knowing precisely what you own and owe. PocketSmith categorizes your assets and liabilities in one easy-to-read section called Net Worth, so you know precisely how much money you have to your name and how much you need to pay off to become debt free. You can just as easily view your personal Income & Expense statement to spot when you have exceeded a budget as well as to see earning and spending totals. 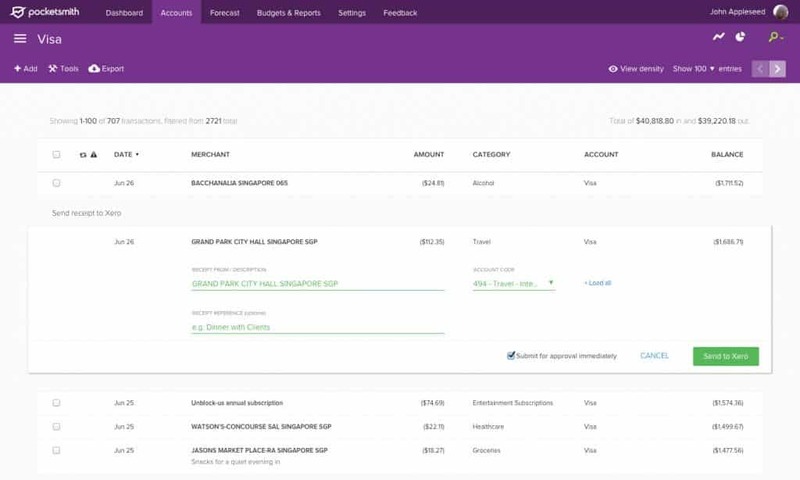 Plus, PocketSmith shows you your very your own personal Income and Expense statement as well as Net Worth and Cash Flow statements, just like a business can keep track of its finances with these three key financial statements. If you already have a financial advisor or you simply want a spouse, partner, or family member to access and manage your account, you can invite them to the app and you can revoke their access at any time if you wish. You can also view an audit log that keeps track of who has logged in and when. This permission is especially valuable for financial advisors who can gather information more easily and save you time and hassle when it comes time to share financial details. Like most other budgeting apps, PocketSmith saves you the hassle of importing your financial transactions by connecting to over 10,000 institutions worldwide as part of its paid subscription plans, Premium and Super. When you log on to PocketSmith, you will be looking at live bank feeds, not outdated transaction histories. 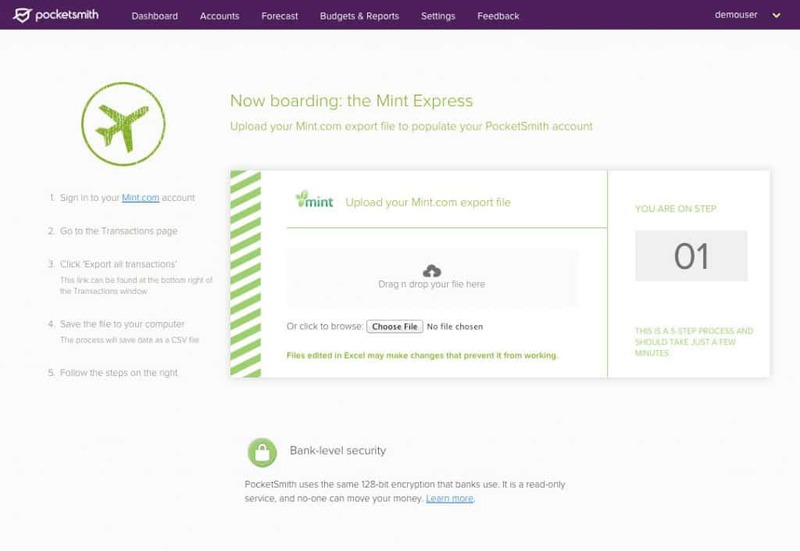 If you already use Mint.com, you can take advantage of the “express migration” tool to import all transactions and categories easily from Mint. The main difference between the free and paid plans is that you must import transactions manually using the free plan but all the hassle is avoided with paid plans. Between the Premium and Super plans, the main difference is you receive unlimited accounts and get 30 years (versus 10 years) of financial projections with the higher tier plan. 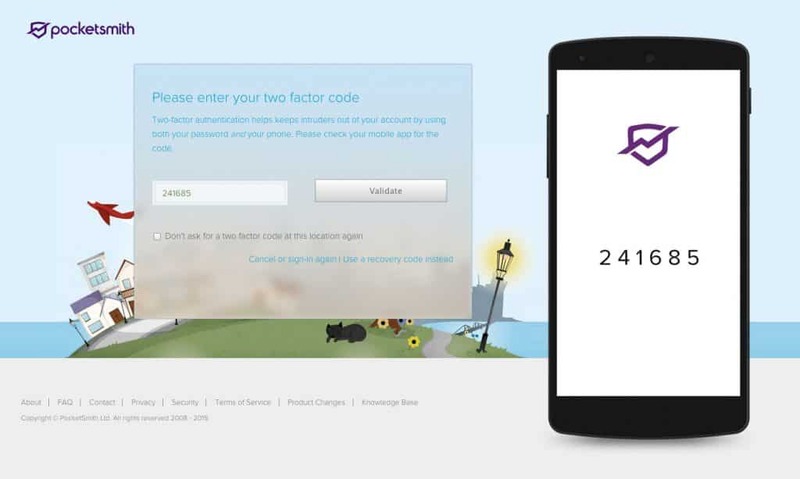 PocketSmith uses two factor authentication which means that you can secure your account by requiring a code sent to your mobile phone each time you login. 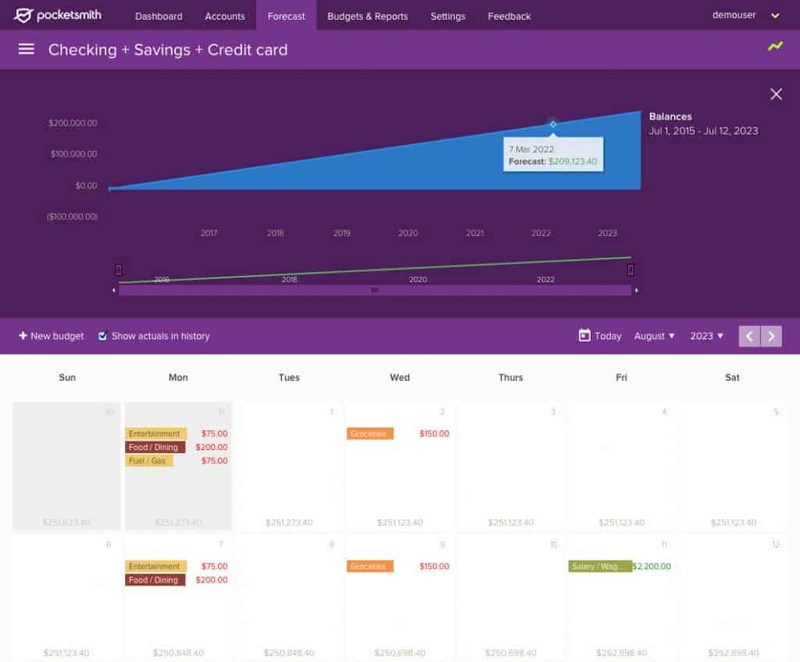 PocketSmith lets you view your finances holistically in one dashboard, sync all your accounts automatically, and predict future cash flows as far as 30 years into the future. Only the paid options cater to automatic imports from Xero or Mint, otherwise manual entry is required for free subscribers. 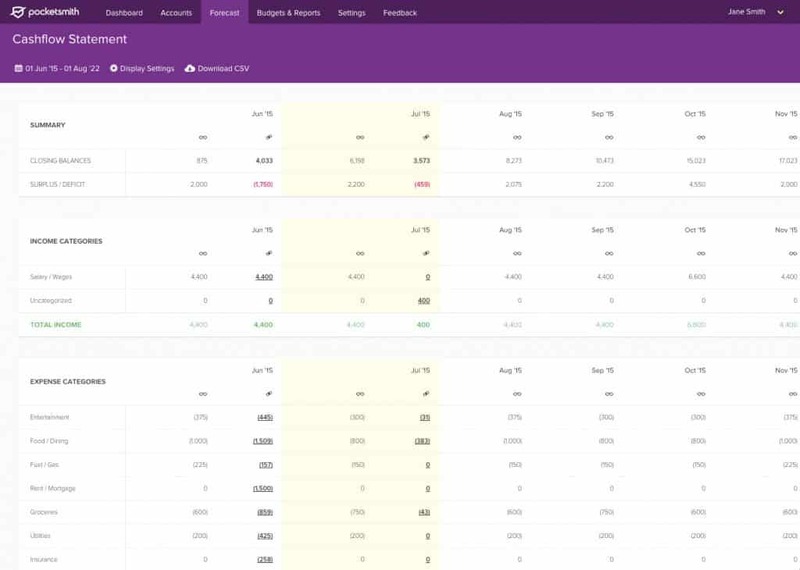 ✅ Forecast Future Cash Flows: The flagship feature is the forecasting tool that lets you see as far into the future as 30 years to get a handle on whether you are on track for your retirement years. ❌ Fee-based Budgeting: PocketSmith has stiff competition from Personal Capital, which offers a free mobile app – but its business model is based on upselling you on investment management services thereafter. ✅ Sync All Accounts In One Place: View all bank accounts, credit cards and loans in a single online dashboard to save you the hassle of logging into numerous accounts. ❌ Free Service Has Limited Functionality: The free service requires you to manually input and update financial transactions, so in order to save time the paid options are the best bet. ✅ Global Access: Regardless of what country you are in or whether you have accounts in many countries, PocketSmith can handle currency conversions daily. 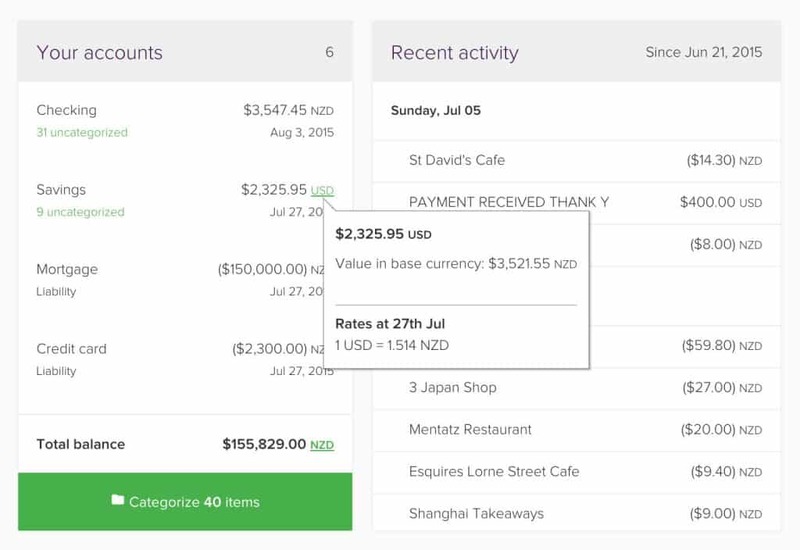 ❌ Intuitive Interface: The platform isn’t quite as user friendly as you might hope, though it is powerful and has extensive capabilities to help you budget smartly. ✅ Schedule Bill Pays: You can schedule your next bill payments on PocketSmith’s calendar. ❌ Basic iOS App: The iOS mobile app is fairly elementary considering how powerful the online app is. 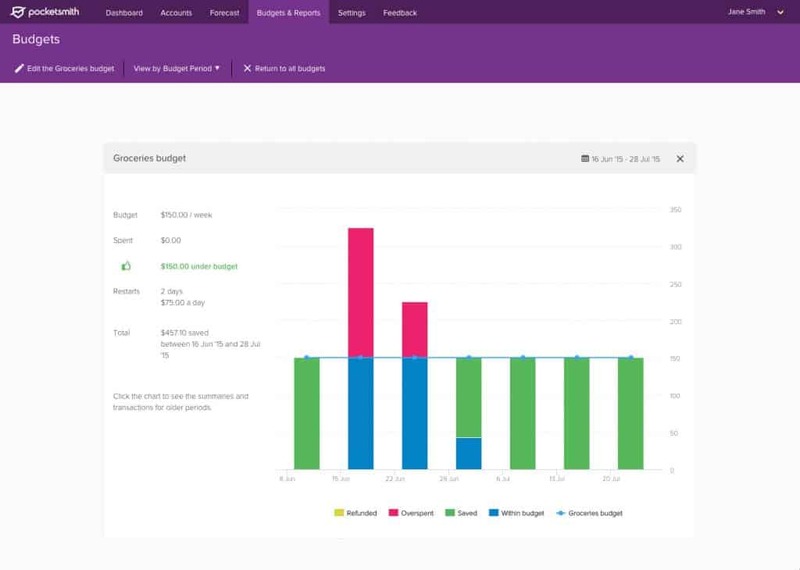 ✅ Budget Spending: Monitor whether you are on track to meet your budget or risk overspending on a specific category. ✅ Automatic Import: If you use any of the premium plans, you can automatically import all financial transactions, including from Mint and Xero. ✅ Personal Financial Statements: PocketSmith will provide you with a personal income & expense, net worth, and cash flow statement. ✅ Security: Two-factor authentication is used for extra security protection. ✅ What-If Scenarios: PocketSmith helps you to view the impact on your budget if you change spending patterns. Imagine if you could look into the future and see how much money you will have and how much cash flow you will generate ten years from now or even thirty years from now? PocketSmith separates itself from most other budgeting tools by estimating what your finances will look like far into the future based on your current income and spending patterns. But that is just one of the useful features to help you improve your day-to-day spending habits. 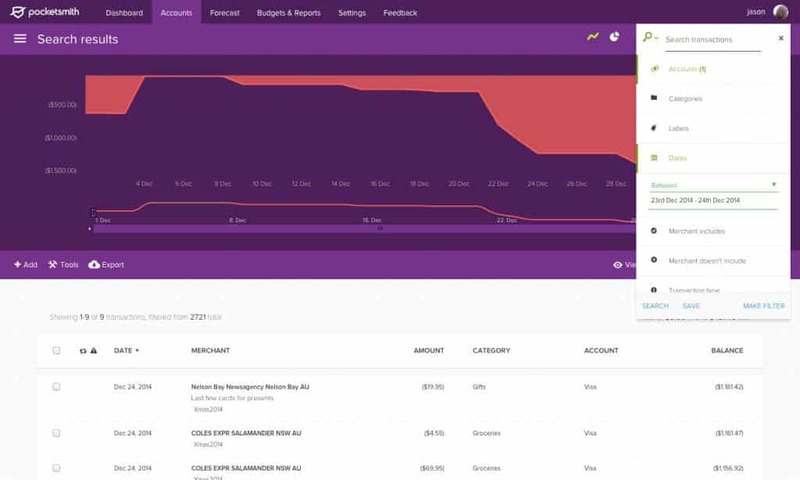 The Budget Calendar feature helps you to know when bills are due to be paid, and the Dashboard lets you easily see how much you are spending on groceries, mortgage/rent, utilities, and other categories. Whether you are in the U.S., Australia, Europe, or just about any country in the world, PocketSmith is compatible, and can easily perform cross-currency conversions. As budgeting tools go, PocketSmith is among the very best, though its mobile app lacks depth, and you will need to sign up to one of the paid subscriptions, which are fairly priced, in order to automatically import transactions and synchronize with your bank accounts. The bottom line is if you have struggle to keep track of your finances, and find yourself coming in over budget regularly and leaving you are cash-strapped, PocketSmith is well worth the monthly fee, especially if you pay on an annual basis in which case you can enjoy 25%+ savings on the top tier plan. ‹ Options Vs Futures: Which Is Right For You?